Hopefully you’ve already read Parts I and II of my series of blog posts on our European adventure. To recap, Europe Part I summarized the awesome two days my husband and I spent in London, and Europe Part II focused on the next phase of our trip in Belgium and the Netherlands. 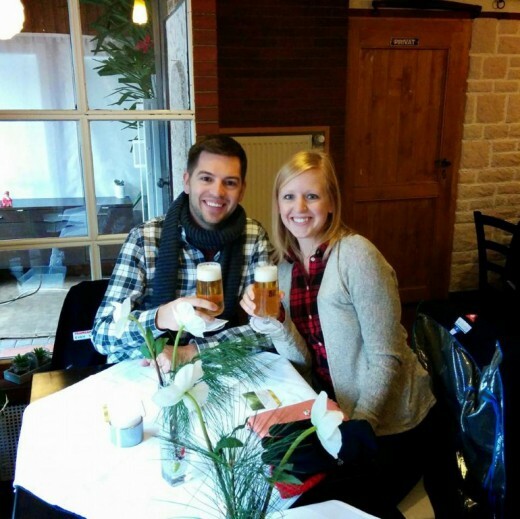 In Part III, I want to share our experience in Germany and Austria! 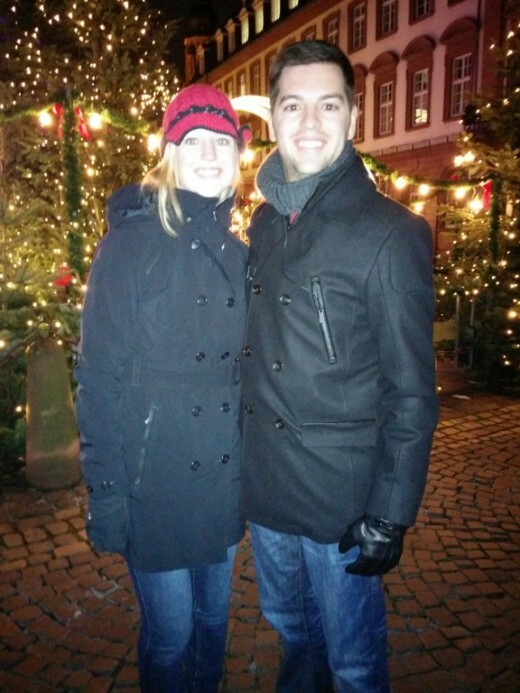 From the Netherlands, we traveled to Germany, where we had several excursions planned in three different cities. We first stopped in Boppard, a small town of about 15,000 people in the Rhine Gorge near the Rhine river. I wish the weather would have been as nice as in the picture below, but it was December when we visited and it was winter. Although most regions in Europe don’t experience frigid temperatures and snow during the winter, the weather is cool and rainy. Regardless of the gloomy weather we had, Boppard was a great place to stop and explore! We did a brief walking tour of the city with our travel director and he pointed out several places to eat lunch. 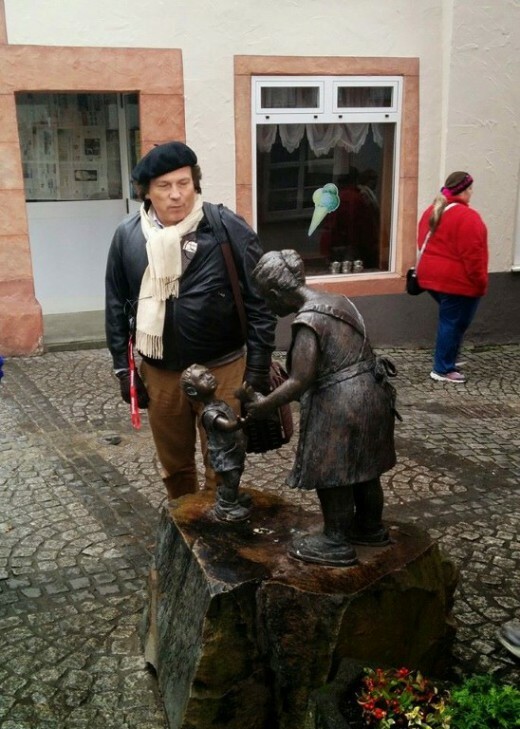 Below is a picture of Emile, our travel director, explaining a sculpture in the city. Evan and I found an authentic German restaurant for lunch and were not prepared for the experience that followed. I believe the restaurant was called Baulig Gaststatten and this was one of our only restaurant outings when we were completely on our own and the waiters didn’t speak any English. We ordered by guessing what the menu said (and using Google translate) and pointing it out to the waiter. Beer was easy to depict on the menu, so we enjoyed some German bier while waiting for our food. We knew we weren’t going to have much time to eat, but we were ok with that. We were taking a boat cruise down the Rhine from Boppard to Heidelberg and we needed to be at the dock to board in an hour. We were enjoying a conversation with a couple from Scotland, when a large group of almost 15 people from our tour came in and decided to order food, about 30 minutes from our boarding time. I won’t get into too many details, but the family ordered food, then got frustrated when the food was not prepared fast enough and left. Our food was delayed because the poor waitress was dealing with 15 abandoned meals that were mid-preparation and was clearly flustered. We had about 5 minutes to eat so we quickly scarfed down what we could and tried to pay the frantic waiter. After a small hand-gestured debacle about “no credit cards,” she finally pulled out the credit card reader and we were able to pay. This is another great example of why it’s a good idea to have some money converted before you travel. We had planned on converting to euros when we arrived in Europe, but it turns out it’s not very easy to find a bank in small towns. You might be wondering why we didn’t convert in London and it’s because the currency in London is pounds, not euros. We sprinted from the restaurant to the waterfront, laughing the whole way, and made it to the boat dock just in time! 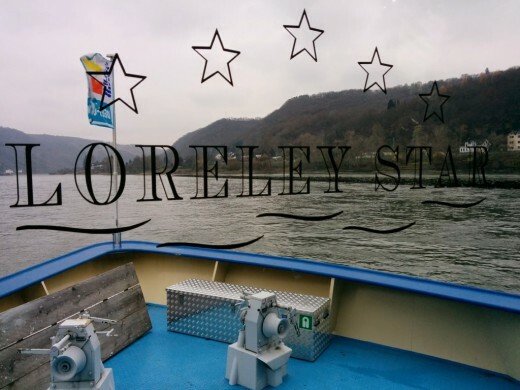 Out of breath, we boarded the Loreley Star. 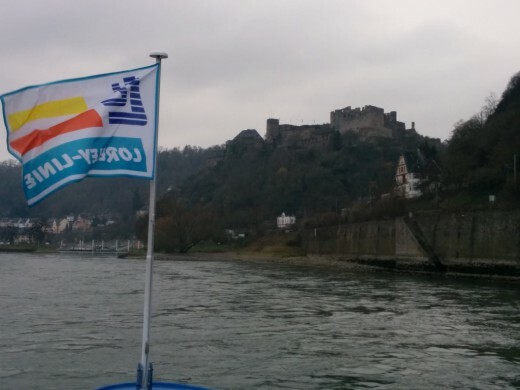 It was overcast and chilly, so we didn’t have the greatest views, but it was still fun to see Germany by boat. One observation: there are castles everywhere! 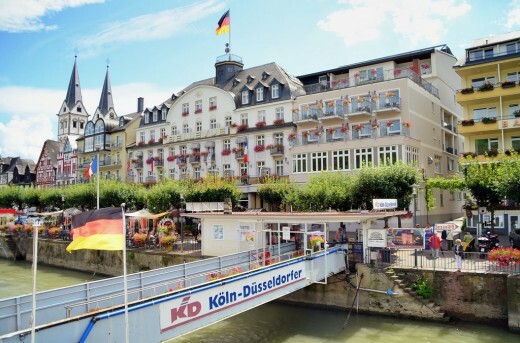 After about a 2 hour ride, we arrived in Heidelberg, a town in southwest Germany located on the River Neckar. We went on another walking tour of the city with our travel director (this was always a great way to get introduced to the area!) 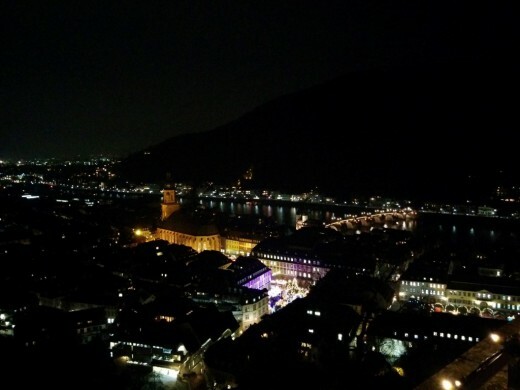 and then we had free time to hike up to the Heidelberg Castle, visit the Christmas markets, shop, or warm up in a local restaurant (it was cold here, too!). 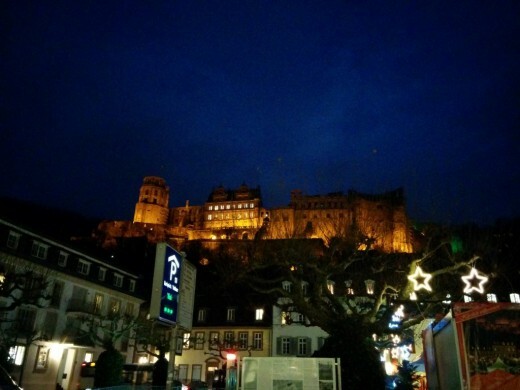 The picture below is a view of the Heidelberg Castle from the heart of the city, near the Christmas markets. Evan and I decided to be adventurous and climb up the insane amount of stairs to see the castle. I’m embarrassed by how tired we got walking up the stairs, but it was totally worth it. We weren’t able to go into the castle, but we walked by it on our way to this overlook area. We had an incredible view of the city! We trekked back down the stairs and explored the Christmas markets before getting back on the bus and heading to our hotel. 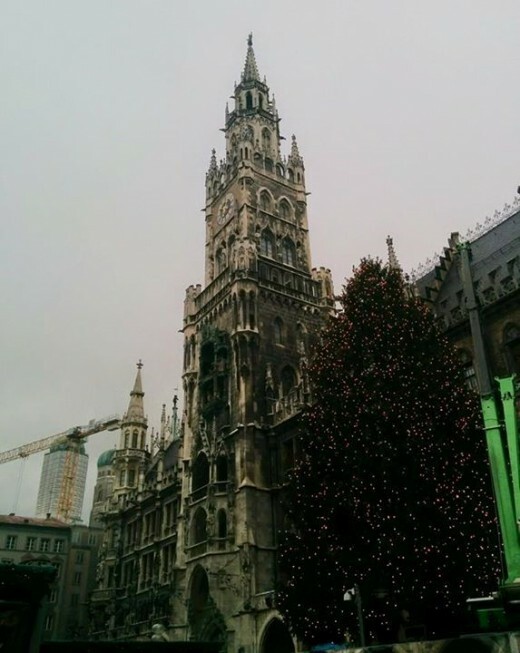 This was our first experience with Christmas markets in Europe, but we saw several more in Munich and Innsbruck. If you’re not familiar with them, the markets are completely decked out with Christmas decor and there are many booths with people selling goods, food, and drinks. It reminded me of a Christmas-themed farmer’s market. That night we stayed at the NH Mannheim in Viernheim, Germany. We enjoyed a buffet style dinner at our hotel with our entire group, before calling it a night. Evan and I were both quite tired out at the end of every day. I guess that’s what getting up at 5:30 am, traveling, and exploring will do to you! 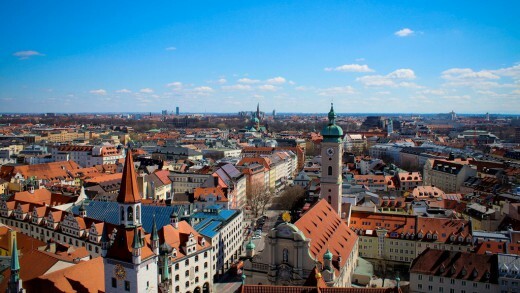 The next morning, we again boarded the bus bright and early and drove 4 hours to Munich. This was our midday lunch stop on the way to Innsbruck, but we had a couple of hours to explore the downtown area. 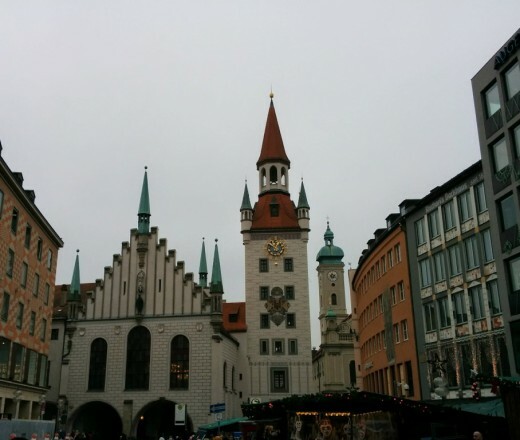 We first stopped by Munich’s central square called Marienplatz, or Mary’s Square. The New Town Hall, shown below, occupies a large portion of the square. City government offices, including city council and the mayor, are located in this building. Other businesses rent space in this building, and a large portion is meant for tourists. 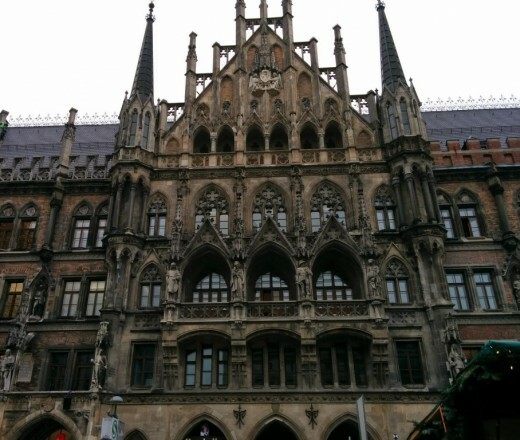 The tower of New Town Hall is the home of the Rathaus-Glockenspiel, the fourth largest in Europe. It consists of 43 bells and 32 life-sized figures, and performs a show daily for tourists. The Old Town Hall formerly held the city government offices prior to the construction of the New Town Hall. If you look towards the bottom left side of the photo, you can see two tunnels. These were created to increase traffic into the square, and it’s actually how we entered the area. 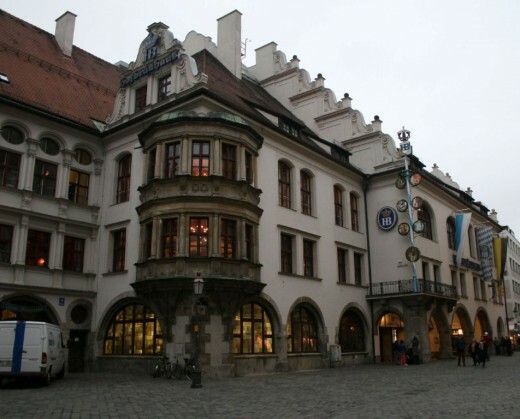 We then ventured over to the Hofbrauhaus, Munich’s well-known beer hall and planned to grab a bite to eat for lunch. However, it was quite busy and we remembered we needed to get to a bank and convert some money, so we changed our minds. I wanted to share a few photos of the Hofbrauhaus though because I thought it was unique and had a different atmosphere compared to restaurants and pubs in the States. We headed back to the square, found a bank and converted money (I actually felt relieved!) and then decided to browse the Christmas markets for some lunch. We found a small place that sold bratwurst and sauerkraut, so we each order a bratwurst and enjoyed it amidst the large crowds in the market. 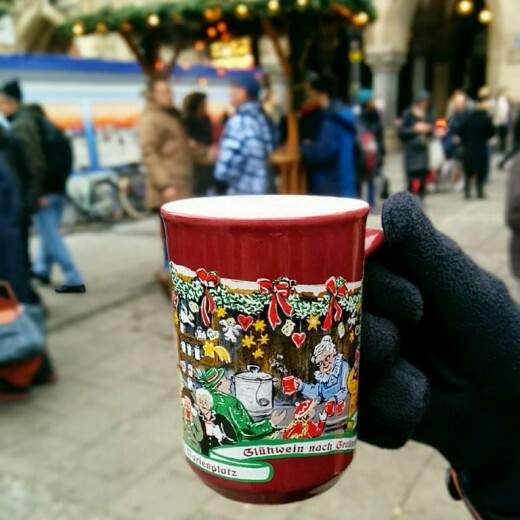 We then tried gluhwein for the first time, which is mulled wine that is typically served hot. It was delicious and a great way to warm up! We met our group on the bus and continued our journey to Austria. 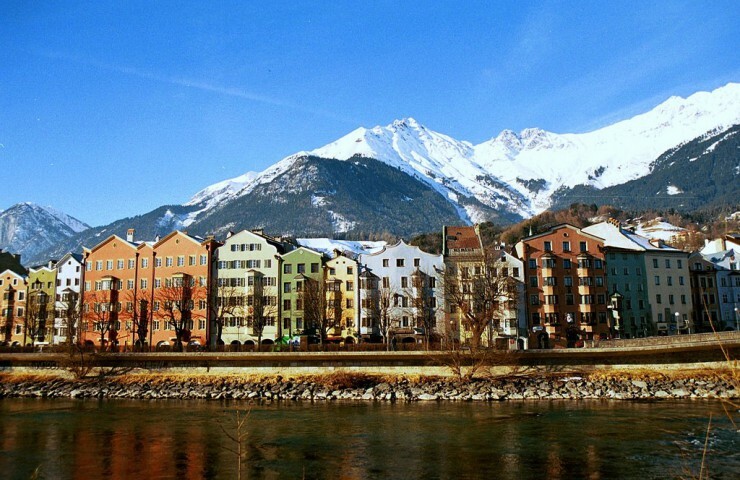 It was a short 2 hour drive from Munich to Innsbruck. As we inched closer to Austria, the change in scenery was becoming more prevalent. We were entering a mountainous region and got our first glimpses of the Alps. 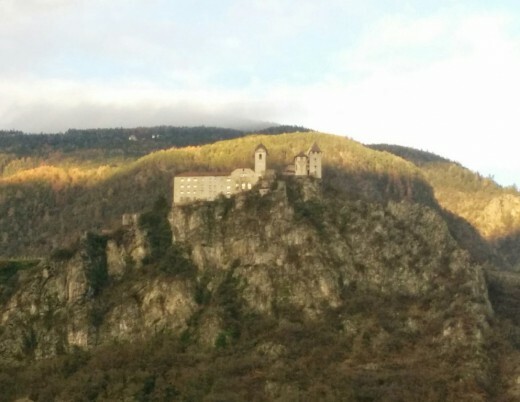 We also saw many more castles along the way, including the one below. I just loved the way this one looked; I feel like it should be a puzzle! 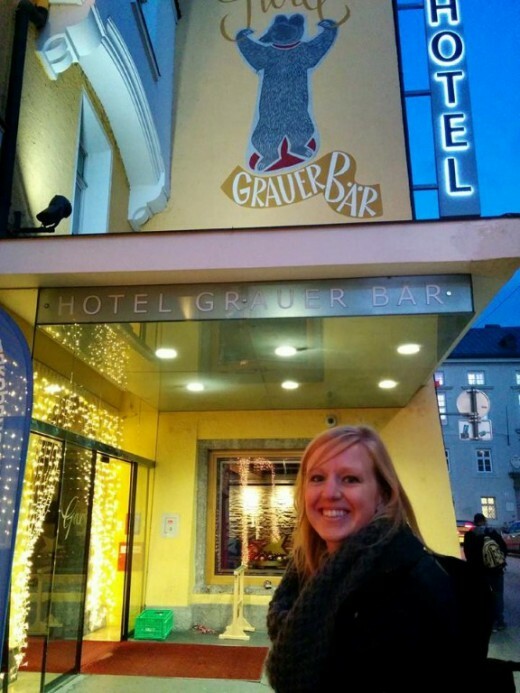 We arrived in Innsbruck early evening and stopped briefly at our hotel, The Grauer Baer (it means the gray bear), to drop off our luggage. 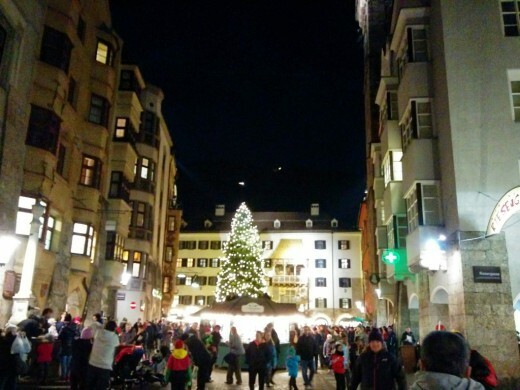 We then all headed down to the city square in the Old Town part of Innsbruck. 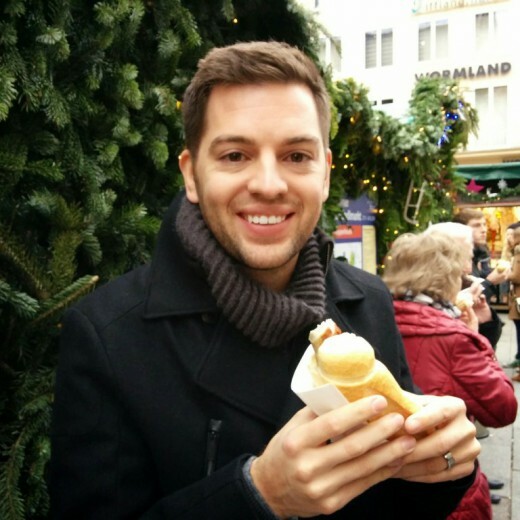 We were again welcomed by the festive Christmas markets, gluhwein, and lots of great smelling food! I started taking pictures of all the Christmas trees we saw in each town; it was my indirect way of enjoying my usual Christmas decor at home. 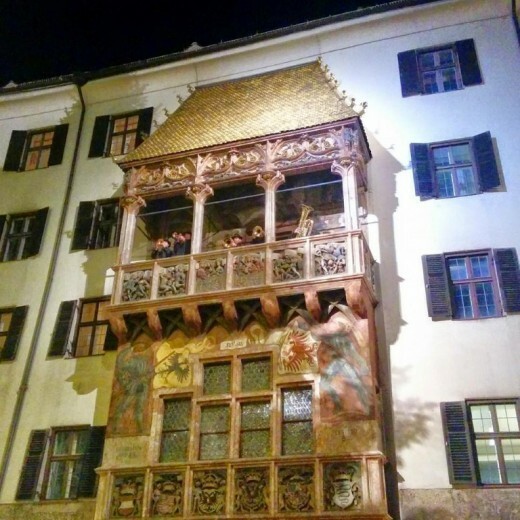 We listened to a small group play Christmas songs from this balcony under the Golden Roof, which is where the Emperor and his wife used to watch festivals and tournaments. 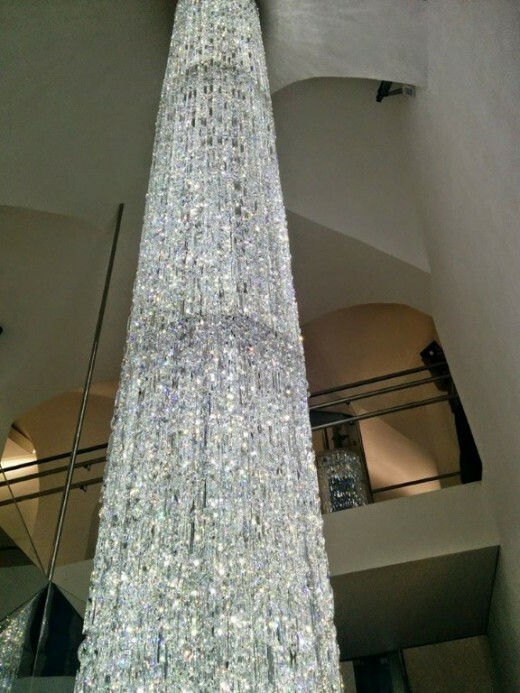 We also went on a tour of the Swarovski store nearby and were in awe of this crazy light fixture made of crystal. We didn’t buy anything, but it was fun to walk through the store and look. The next morning we boarded the bus and traveled to the place I was looking forward to the most: Italy! Check back soon to hear about our adventures in Venice, Rome, and Florence!